Born in Walton-on-Thames, Surrey Mark re-located to Somerset in his early 20’s and has lived here for almost 30 years. Draughtsman to then finally studying Technical and Architectural illustration at Richmond-Upon-Thames College, Middlesex. In the West Country Mark worked as a Technical illustrator for a number of years before working as a Graphic Artist on the South Devon coast. During these years Mark built up a large client base working as a freelance illustrator and graphic artist, finally he was in a position to launch his solo freelance career and has been working in this capacity for over 23 years. 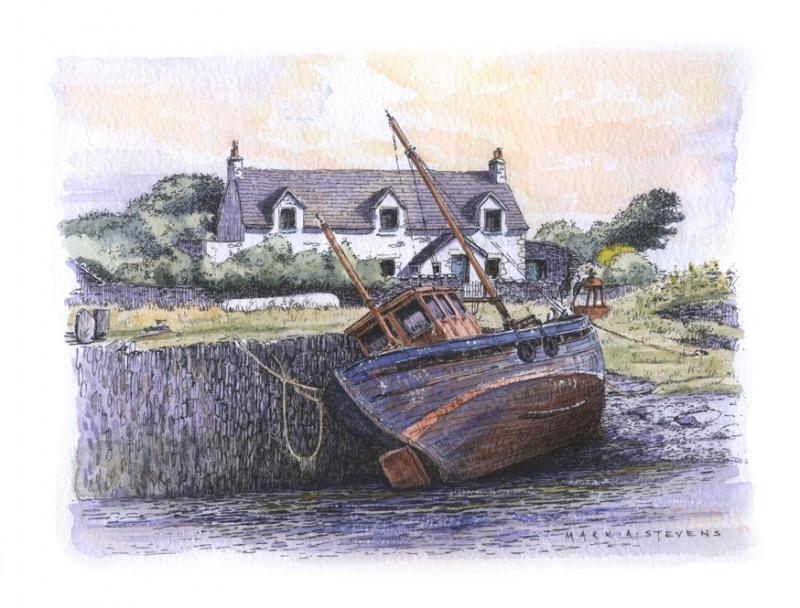 Having always had a passion to paint and draw Mark works in pen & ink and watercolour, and developed a style of painting landscapes and seascapes that appeals directly to Mark and in a way that he particularly enjoys. He has a very keen interest in etching and has participated in a number of short courses, which he would like to pursue.